With a focus on high quality, handmade cement tiles, Avente Tile’s Guide to Buying Cement Tiles is destined to become the resource for exploring the countless options and design opportunities that can only be achieved with handmade cement tile. July 16, 2014 - PRLog -- Handmade cement tile has to be one of the most beautiful types of tile available for transforming a space into a personal expression of pattern, style and design. However, since it is a handmade product, figuring out what makes a high quality and durable cement tile isn't immediately obvious. 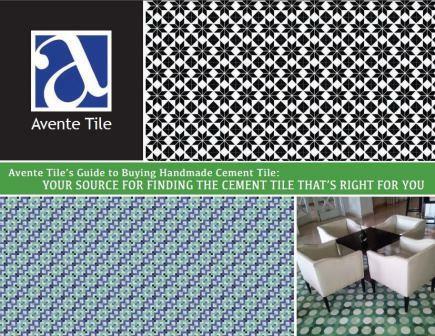 For that reason, Avente Tile is proud to announce the launch of its Guide to Buying Handmade Cement Tile (http://www.aventetile.com/whitepapers/download-cement-tile-buying-guide.cfm) to help you make sense of the choices available. The Guide, which is based on the hard-earned knowledge and experience of Avente Tile's founder Bill Buyok, features 14 pages of inspirational cement tile installations and patterns, and most importantly, valuable tips for buying handmade cement tile culled through Bill's vast experiences and travels involving handmade cement tile. Months of thought, preparation and revisions went into creating this cohesive cement tile buying guide so that it could be referred to at any time, day or night, 24/7. Whether you choose to print out a copy of the Guide, or keep it on your computer's desktop, we wholeheartedly feel that having a readily available source at your fingertips is a priceless tool for generating creativity, while greatly expanding upon the design needs and options of your tile project. • What is Handmade Cement Tile? • What Shapes, Sizes & Formats Are Cement Tiles Available In? • What Cement Tile Design Styles Are Available? • How Do I Coordinate Handmade Cement Tile Sizes, Shapes, Formats and Styles? • What Are the Next Steps For Buying Handmade Cement Tiles? Further, we've included active links within the Guide that immediately direct you to comprehensive information about the topic or product you’re reading about. You don't lose your place within the Guide, nor do you lose valuable time in your quest to find more information. • Find the cement tile that's right for you. • Learn how to distinguish quality cement tile from inferior ones. • Understand the types, formats, colors, options and designs available. • Set realistic budgets, costs for freight, and what to expect for delivery. • Tips for when to use in-stock tiles, custom tiles, and how to create your own designs. After reading our Guide, contact us with any additional questions you might have about cement tile. We encourage questions on our blog, too. Feel free to leave your question in the comments below and we'll promptly answer them within two business days. Of course, everyone at Avente Tile is well-versed and experienced in answering any possible question you may have. Therefore, please don’t hesitate to call us at 888.739.4972; or email: info@aventetile.com.